The Gorakhnath temple has been at the centre of local politics and only the candidates believed to ‘have its blessings’ have ever won elections from there. New Delhi: It was 25 years ago that the Samajwadi Party (SP) and the Bahujan Samaj Party (BSP) last formed an alliance, in the face of a strong Hindutva wave following the Babri masjid demolition. The coalition went on to form the government in Uttar Pradesh. 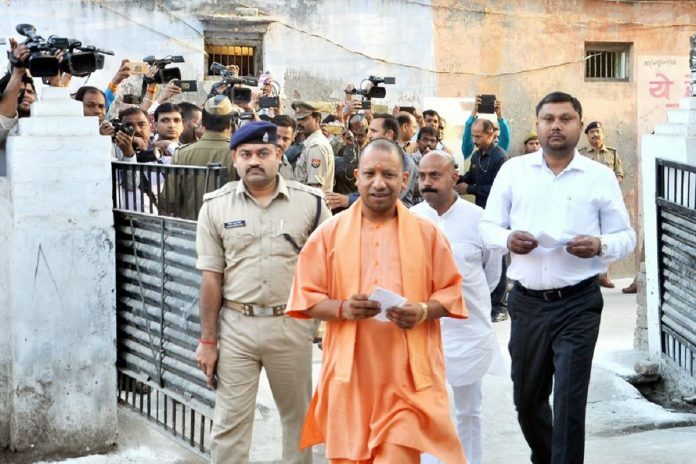 Cut to the present, the bitter rivals, again in alliance, are on the verge of defeating the BJP from its safest seat in the state — Gorakhpur has been with the party since 1991, with five consecutive wins for Yogi Adityanath, now the chief minister of the state. The closest the opposition came to winning the seat in the intervening years was in 1999, when Adityanath’s victory margin declined to 7,300 votes. It was then that Adityanath formed the Hindu Yuva Vahini in a bid to consolidate his position in Gorakhpur and nearby areas. According to the latest trends Tuesday afternoon, the SP candidate in Gorakhpur was leading by over 20,000 votes, as was the party’s Phulpur nominee, and a much-needed victory for the SP and the BSP ahead of the 2019 polls seemed within reach. It was an indication that the large social alliance they had stitched up was again working in their favour. When BSP supremo Mayawati announced, a week before the elections, that her party would support the SP candidates, questions were raised on whether her party’s voters would be comfortable voting for its arch rival. In Gorakhpur, SP fielded Pravin Nishad, son of Dr Sanjay Nishad of Nishad Party, formed just two years ago. In the 2017 assembly elections, the Nishad Party, in alliance with two others, the Mahan Dal and the Peace Party, contested from 17 seats in Gorakhpur and nearby areas with a sizeable population of Nishads. But they couldn’t manage to win a single seat. The BJP had won all the five assembly segments of Gorakhpur in 2017 with victory margins of more than 20,000 in each seat. This bypoll, the SP had not just the BSP’s support, but also that of the Peace Party, the Mahan Dal and the Nishad Party, which helped it consolidate a larger vote share among Dalits, OBCs, Muslims and most backward classes (MBCs). The social alliance proved stronger than the BJP’s upper caste voter base comprising Thakurs, Brahmins, Kayasths and some MBCs. In Phulpur, with a sizeable Patel population, the SP fielded local Nagendra Patel against the BJP’s Kaushalendra Patel. But trends indicate the Patels who voted for the BJP in the Lok Sabha and assembly elections went with the SP. Jailed gangster Ateeq Ahmed, a former SP member who contested as an Independent and was expected to eat into the SP-BSP coalition’s Muslim votes, got just over 20,000 votes. Even in urban areas such as Allahabad west, the BJP was struggling to manage a lead over the SP. Phulpur, however, was never the BJP’s stronghold, and has been won by the SP four times. Deputy CM Keshav Prasad Maurya, its only BJP representative, won the seat by a margin of 3 lakh votes in 2014, getting 5,03,564 votes. The SP and the BSP’s votes together totalled 3,58,966. In 2017, however, the BJP won all the five assembly segments of Phulpur with an average margin of 30,000. A defeat in Gorakhpur is certainly going to be seen as a big loss for Yogi Adityanath as well as the BJP. The Gorakhnath temple has been at the centre of local politics and only the candidates believed to “have its blessings” have ever won elections from there, be it for the post of mayor or MLA. It came as a big surprise when Upendra Dutt Shukla was declared the BJP’s candidate for last week’s bypolls as he was known to have differences with Adityanath. In the 2006 bypolls for the Kauriram assembly seat, Shukla was denied a ticket at Adityanath’s intervention. Shukla contested as an independent and the ensuing division of votes won the SP the seat. Shukla is a Brahmin, and his selection was a bid to woo the Brahmins troubled by the rising clout of the Thakurs under Adityanath’s government. Adityanath belongs to the Thakur community. In fact, Adityanath camped in Gorakhpur for a week to ensure the BJP’s win, but the fact that the party still lost could signal a big power shift underway in the Purvanchal region. The twin defeats may also further widen the well-known rivalry between Adityanath and his deputy Maurya. Overall, the results might prove a setback for the BJP’s aim to maintain its 2014 tally, 73 out of UP’s 80 Lok Sabha seats, in 2019. If the party loses a few of its seats in UP, it would find it difficult to bridge the gap from other states. The talks of opposition unity ahead of 2019 are sure to get a boost with these wins. Next time the opposition leaders come together for an alliance meeting, on 27 March, they would approach it with some success in hand. In 2017, for example, the combined vote share of the SP and the BSP was higher than the BJP’s — 50 per cent against its 41.